A new bookstore and cafe has opened in Rittenhouse. The new arrival, called Shakespeare & Co., is located at 1632 Walnut St. It's an outpost of the venerable Manhattan institution, which opened in 1983 (and not related to the even longer-standing Parisian store of the same name). Its two floors of books include sections for science fiction, humor, classics, thrillers, politics and more. There's also a substantial children's area. Caffeinated beverages like coffee and tea are available. You can also make a small meal from the sandwiches, bagels, pastries and salads on offer. The new bookstore has garnered rave reviews thus far, with a 4.5-star rating out of eight reviews on Yelp. Deepika N., who was among the first Yelpers to review the new spot on Oct. 7, wrote, "There is a small cafe with a decent amount of seating and outlets right when you walk in. The drinks are decently priced for what you get, and the barista was super friendly. For me, it was the perfect environment to get things done." Yelper Brian M. added, "I ordered a coffee in the front and took a quick lap through the bookstore before coming back up to get it. The light is great, with the large front windows letting in a good amount of natural light, and the tables are great for studying or a one-on-one meeting. The coffee was good, I thought, and the staff very friendly." 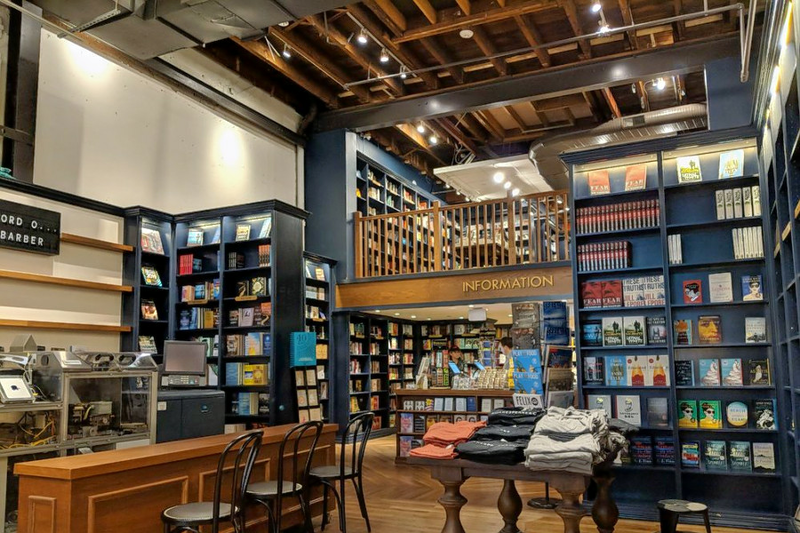 Head on over to check it out: Shakespeare & Co. is open from 7:30 a.m.-8 p.m. on weekdays, 8 a.m.-7 p.m. on Saturday, and 9 a.m.-6 p.m. on Sunday.